Energy Cabinet Secretary Charles Keter has extended the mandate of the interim management team at Kenya Power for two more months. The appointments, which include Engineer Jared Omondi Otieno appointment as acting Managing Director, were made after the prosecution of the firm’s managers over corruption charges. These ones should continue.The other group was just after looting. 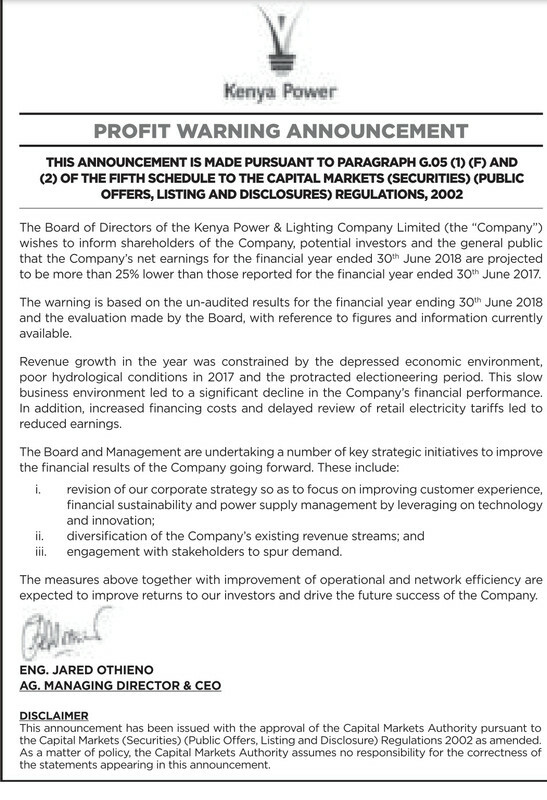 He has proved himself to be the ultimate authority on kplc going forward. His calls have been ridiculously accurate. Sad. In a well run country, utilities are a safe bet for investors. But this one of ours. only in kenya power,but all angles of kenya economy. 2.Poor hydrological conditions-geothermal is cheaper and reliable. 3.Protracted electioneering period-its true but now with handshake,things should be better. 4.Increased finance costs-these loans should be used to create value to the company. 5.Delayed review of retail electricity tarrifs-Arap mashamba refused kenya power to increase it.